The Thick-billed Weaver was formally described by Nicholas Aylward Vigors, an Irish zoologist and politician. Vigors was a co-founder of the Zoological Society of London in 1826, and its first secretary until 1833. 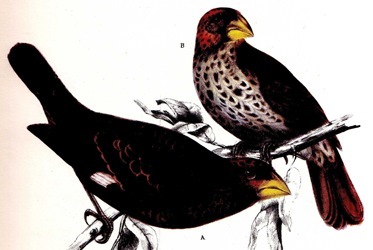 The Thick-billed Weaver specimen was presented to the Zoological Society of London by Henry Ellis, an English librarian at the British Museum. It is not known from whom Ellis obtained these specimens. Vigors described nine new species from the Ellis collection and the specimens were all believed to have come from Algoa Bay and surroundings in the Eastern Cape. 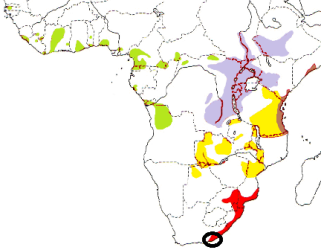 Two species, however, the Purple-crested Turaco Tauraco porphyreolophus and the Spotted Thrush Zoothera guttata, have their southern limits further north in the Transkei (and may have come from Durban), but the rest of the specimens probably did originate from the Algoa Bay area. 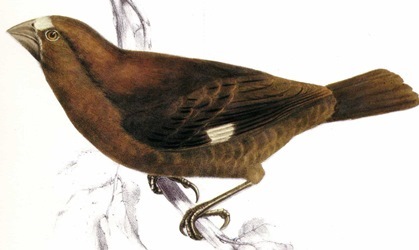 The first illustration of a Thick-billed Weaver is in Swainson (1838), showing a line drawing of the very heavy bill of a male. A few years after this species was first described, Andrew Smith found this species in 2 places: in the Eastern Cape forests (probably not too far from Grahamstown, as Smith was based there in his early years in South Africa) and around Durban (Port Natal) in 1832. Smith commisioned the first colour illustrations of the The Thick-billed Weaver - these were published as 2 plates in Smith (1840), and painted by George Henry Ford. 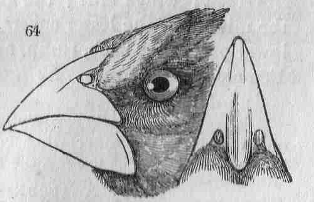 Pyrrhula albifrons	Vigors 1831; Proc. Zool. Soc. London, p.92	1831	Algoa Bay, eastern Cape. albifrons Latin: albus, white; frons, the forehead, brow. Abyssinian Grosbeak Weaver, Angola Grosbeak Weaver, Ashanti White-fronted Grosbeak, Black Swamp Weaver, Cameroon Grosbeak Weaver, Cavort chewer, East Coast Grosbeak Weaver, Grosbeak Weaver, Hawfinch Weaver, Kenya Grosbeak Weaver, The white-headed Coryphegnathus, White Nile Grosbeak Weaver, White-fronted Grosbeak, White-fronted Weaver. The type specimen is not in the British Museum (Warren 1971), and is thus probably lost.